So rich and yum! I would totally scream for this ice cream! 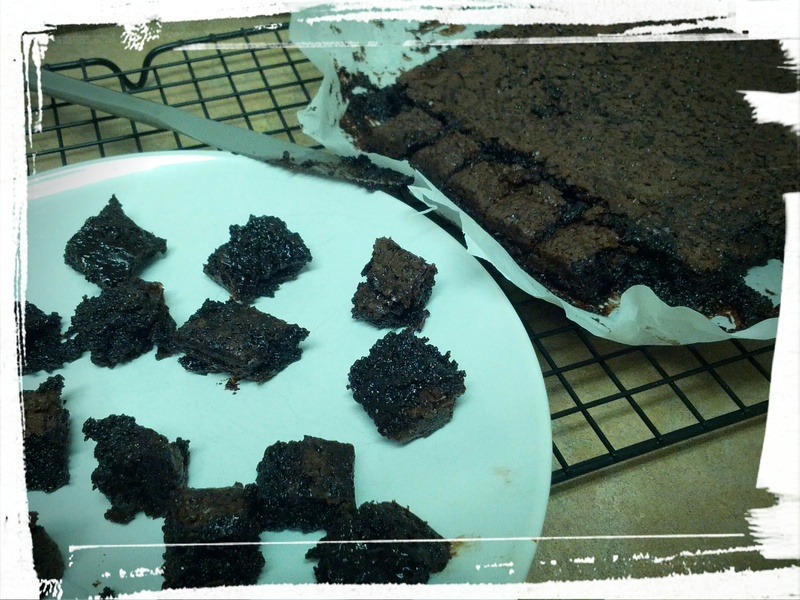 Over a year ago, I made a batch of gluten-free, quinoa-based brownies for a dinner party that I hosted. They. Were. Awesome! So rich, so buttery and chewy, all cocoa and caramel-ly tasting, and just plain yum! I had served it with some homemade ice cream, and had the brainwave to one day combine the two to make a delicious vanilla ice cream, with chunks of brownie in it. Well, that “one day” arrived! This ice cream is so beyond delicious! It’s rich and creamy, with chunks of chewy brownie throughout it. I made a small-ish batch of this ice cream, but wish I had made double or triple the quanitity. This particular brownie recipe is unique in that even when it is frozen, it will still be chewy. (Nothing is worse than gnawing on a frozen nugget of something in your ice cream.) Basically, you whip up the ice cream mixture, let it half freeze, then push in small chunks of the brownie and let the whole thing fully freeze. Then it’s time to scoop and eat! Rich and dense and ready to add to the ice cream! Or to my mouth. That also works. Make the brownies, and let cool. When cool, lift out of the pan by the parchment paper handles, place on cutting board and carefully peel off parchment paper. Cut the brownies into 1 inch sized pieces. Taste test, because why not. Set remainder aside. Whip the cream until all fluffy and whipped-cream-like. Stir in the condensed milk, vanilla extract, and rum. Spread in a shallow baking dish. (I used a plastic Ikea container. But you do you!) Place in freezer until half-set (edges are firm but centre is not). 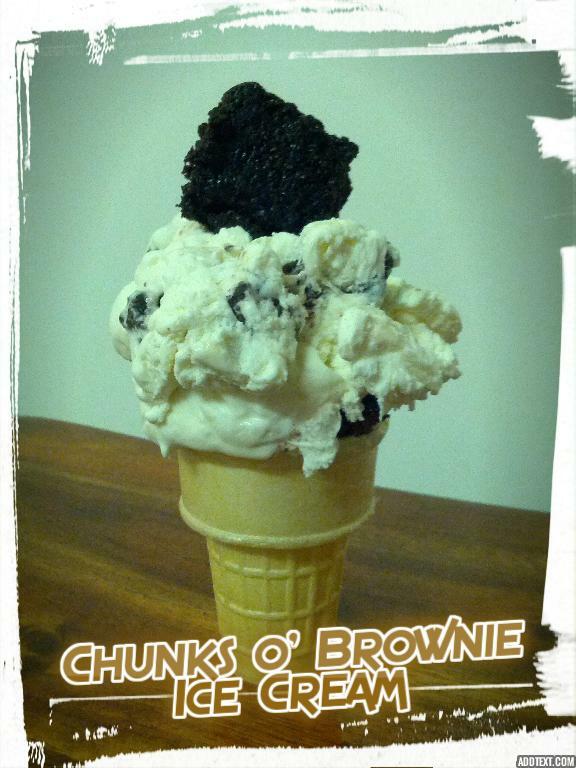 Press the chunks of brownie all the way down into the ice cream, spacing them out as you wish. Sprinkle a few chunks on top as well. Freeze until fully set. Scoop, and serve! 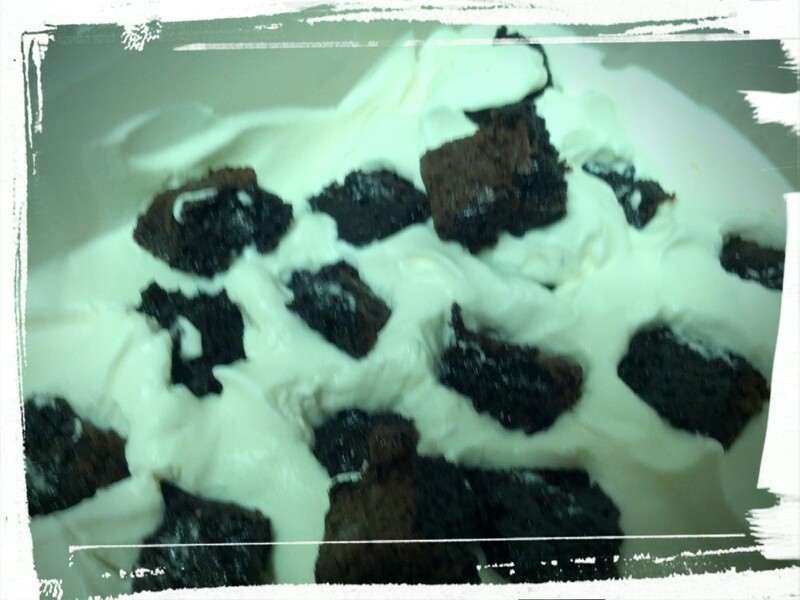 Creamy swirls with brownie chunks! This ice cream is preservative-free, and extra-creamy! It has the exact consistency of store-bought ice cream when scooping, but fyi, it will melt a little faster than some ice creams simply because it is so pure. But that’s not a problem — just lick it up! Mmm…I want some ice cream now. It’s yum-city! Impress your friends and family with this decadent dessert, and enjoy! This entry was posted in Desserts Not Otherwise Categorized on September 15, 2015 by Margaret.